If there's just one poster artist that you need to know about - the one effectively responsible for ushering in modern advertising as we know it now, with its notorious capacity to surprise and shock - it has to be the Italian-French designer, Leonetto Cappiello. So long-lived is the aesthetic that Cappiello helped to introduce to all advertising, it's easy to forget that poster art prior to his innovation was of a much more traditional, painterly style – think legendary figures Jules Cheret (1836-1932), Alfred Choubrac (1853-1902) and Hugo D'Alesi (1849-1906). Indeed, Cappiello proved a more than worthy successor to Cheret and other great lithographers like Toulouse-Lautrec (1864-1901) and Alphonse Mucha (1860-1939), becoming the pre-eminent poster designer in Paris in the early years of the 20th century. By the late 1900s, the Art Nouveau aesthetic - with its emphasis on curved lines and harmony with nature - was on the wane. A new wave of poster artists rejected what they saw as the old style's fussy detail in favour of a more direct and immediately impactful approach. Born in Livorno, Italy on 9th April 1875, a young Cappiello had exhibited his paintings for the first time in Florence in 1892, and before the century was over, he had already moved to Paris and achieved note as a caricaturist of the city's actresses. In 1900, Cappiello's poster art career began to gain momentum through a contract with the printer Pierre Vercasson, who recognised Cappiello's ability to create the highly memorable posters that would be necessary to lure profitable new advertisers to his agency. By this point, Cappiello was already producing extremely distinctive posters - including for the newspaper Frou-Frou - and it was clear that the young man would not be a mere slavish imitator of the past poster art greats. Taking as his cues the energy and simplicity of Cheret and Toulouse-Lautrec's caricature style, Cappiello focused squarely on the creation of simple, powerful and often bizarre or humorous images. The fin-de-siècle age was disappearing as Parisians began to embrace the faster pace of life of the 20th century, as Cappiello's instantly compelling posters seemed to epitomise. 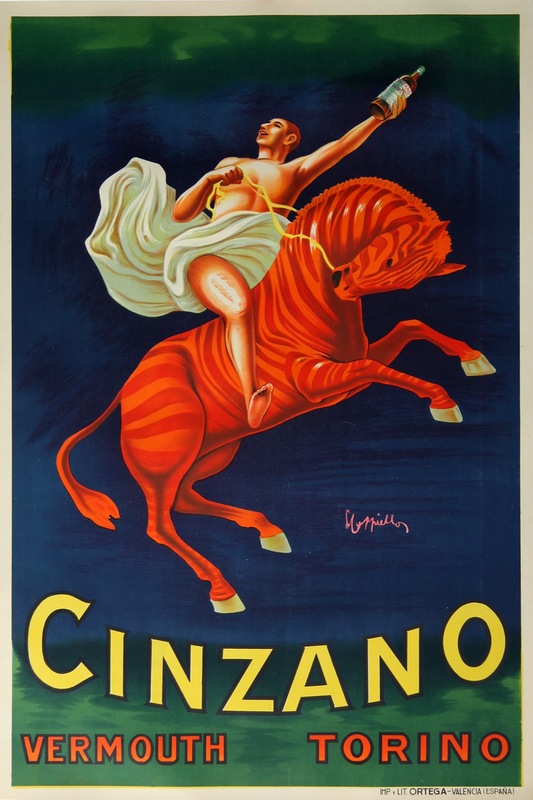 Cappiello’s unique and innovative poster designs usually featured bold figures on black backgrounds - the opposite of what was the norm during this time. A classic early example of the Cappiello style was the 1906 French aperitif advertisement Maurin Quina. It depicted a green, devil-like figure uncorking a bottle - the colour was a reference to the nickname for absinthe, la fee verte (the green fairy). 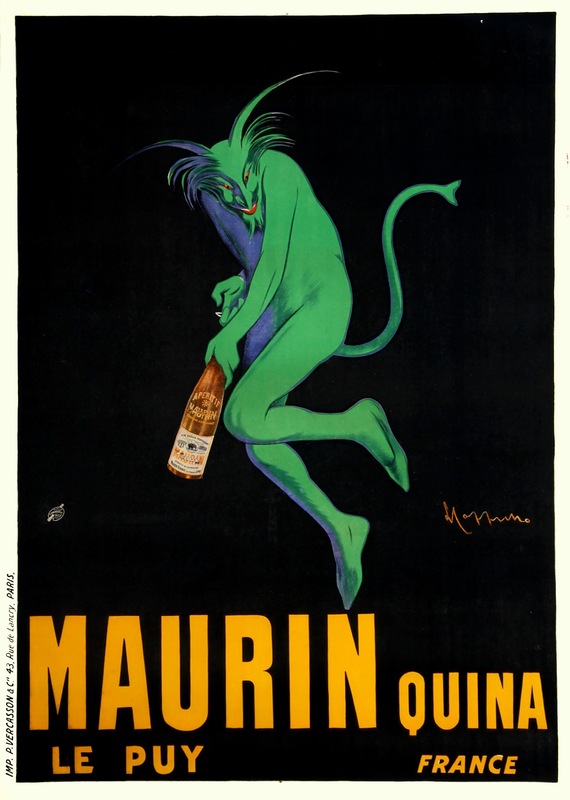 Similar infernal imagery surfaced in several other Cappiello posters for alcohol. The Cappiello visual template was set, and right up to, and for many years beyond the First World War, he produced hundreds of posters that revolutionised how we continue to see visual marketing today. His posters advertised everything from wine, cognac and vermouth to pasta, espresso and umbrellas. In the case of the latter, Cappiello created a poster for the luxury brand Revel, showing three figures with their heads each obscured by the company's parasols. 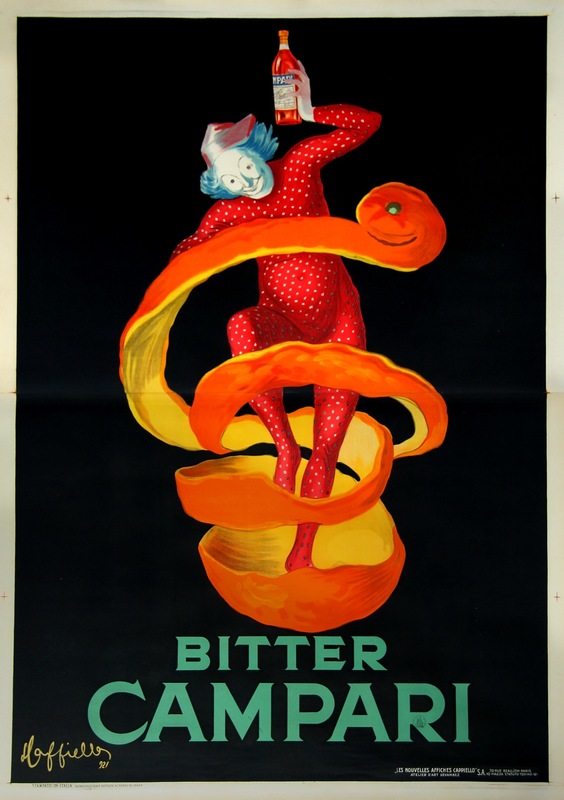 Another especially famous Cappiello image was for Bitter Campari, and showed a jester ascending from an orange peel, bottle in hand. Created in 1921, this poster very much fit in with the rising popularity of the cocktail and the ever-greater number of female drinkers, with the visual theme based on Campari's suggestion that customers enjoy the aperitif with a splash of orange. Although Cappiello's reign as the dominant Parisian poster artist would ultimately be brought to an end by the rise of the Ukrainian-born Art Deco master Adolphe Jean-Marie Mouron (1901-1968), otherwise known as A.M. Cassandre - who produced his own first poster in 1923 - Cappiello's astounding legacy had already been assured. Cappiello had signed an exclusive contract with the Paris publisher Devambez in 1921, his association with the agency lasting until 1936. You don't have to look too far to find continued examples of Cappiello's massive impact on the advertising world. Artists to be inspired by his advertising style included the Italian Federico Seneca (1891-1976) and Donald Brun (1909-1999) and Herbert Leupin (1916-1999) in Switzerland. Meanwhile, Cappiello had continued as a caricaturist even while making a massive impact as a poster artist, and his followers in this regard ranged from Jean D'Ylen (1886-1938) in Paris to the Achille Mauzan (1883-1952) in Italy. The father of modern advertising, as he is commonly referred to today, died in 1942 in Cannes, France, after a career that had seen him create more than 1,000 advertising posters. Today, Cappiello's legendary poster art can be seen in museums across Europe, as well as in the collections of the most discerning enthusiasts of his pioneering style. His applied art was also the subject of a major 1981 retrospective at the Galleria Nationale du Grand Palais in Paris. Exhibitions and retrospectives for this wonderful artist continue to this day.